The Grampians is one of the most popular natural attractions in Victoria. Located between Adelaide and Melbourne, it consists of a vast national park that surrounds a series of rugged mountain ranges. Explore the many walking tracks including the Grampians Peak Trail, enjoy panoramic views from several lookouts, and visit beautiful lakes and waterfalls. You will be sure to encounter Australian wildlife, native wildflowers and discover ancient Aboriginal sites which are shrouded in mystery. Right in the centre of the Grampians National Park is the tourist village of Halls Gap. This holiday town includes shops, restaurants and a large number of accommodation properties including caravan parks, apartments, chalets, cottages and motels. In a direct straight line, the distance from Adelaide to Halls Gap is about 430 kilometres. There are several ways to get to The Grampians from Adelaide. The journey from Adelaide’s CBD to Halls Gap is around 500 kilometres. Head south-east along the South Eastern Freeway (M1). This road becomes the Princes Highway (A1) after passing to the south of Murray Bridge and crossing the Murray River. At Tailem Bend, which is almost 100 kilometres from Adelaide, continue driving straight and then this road becomes the Dukes Highway (A8). Follow the Dukes Highway for around 190 kilometres, passing through Keith and Bordertown, until reaching the state border between South Australia and Victoria. At this point advance your clocks by 30 minutes due to crossing a timezone. Once into Victoria, the highway is called the Western Highway (A8). Follow the Western Highway through Kaniva, Nhill, Dimboola and Horsham. The quickest way from Horsham is to follow the Western Highway (A8) for about 45 kilometres and turn right into Mt Drummond Road, left into Ledcourt Road, right into Greenhole Road, right into Fyans Creek Road and right into Grampians Road (C216) which then leads directly to Halls Gap. While involving a number of turns through sealed local roads, it avoids crossing major mountain ranges into the national park. Alternatively, for a more scenic route, turn right off the Western Highway about 15 kilometres out of Horsham onto Northern Grampians Road (C222). From here, it will be a 57 kilometre to the centre of Halls Gap via Wartook and Zumsteins. This road is also known as Mt Victoria Road once you get inside the Grampians National Park. Before reaching Halls Gap, take a short detour to the famous MacKenzie Falls, Wartook Reservoir and the scenic Reed Lookout. The entire journey will usually take around 5 hours and 15 minutes if you drive non-stop, however allow at least an extra 15 minutes if you choose the more scenic route via Wartook. Given the length of this journey, it is recommended that you do not drive for more than 2 hours continuously without taking a break. Getting to Halls Gap from Adelaide using public transport requires the use of a train and a bus service. Catch The Overland train from Adelaide’s railway station to Stawell in Victoria. This will take about 6 and a half hours. Currently, this train only runs Monday and Friday, arriving at Stawell at 2:54pm. See the timetable for the Adelaide to Melbourne train. From Stawell railway station to Halls Gap, there are two bus services. The V/Line bus to Halls Gap operates Monday to Friday, however it departs from Stawell in the middle of the day, between 12:20 and 12:50, depending on the actual day. Unless you are planning to stay overnight in Stawell (which you can, it’s a lovely town and there are a number of accommodation options in Stawell), then this bus service is not suitable. In order to do the journey from Adelaide to Halls Gap in one day, you will need to catch Sandlant’s Halls Gap bus which departs from Stawell on weekdays at 7:15am and 3:55pm. The only choice is to take the 3:55pm service, which means you will need to wait for an hour in Stawell after arriving by train. Once on the bus, it will have you arriving in the Halls Gap town centre within about 20 minutes. See the timetable for the bus to Halls Gap. Having your own vehicle in the Grampians will make it a lot easier to get to the many attractions in the national park and surrounding areas, however the drive from Adelaide can be a long one. Another option is to catch The Overland train from Adelaide to Horsham (see the timetable for the Adelaide to Melbourne train) and then hire a car in Horsham for the 55 to 70 minute drive to Halls Gap. The Great Ocean Road is one of Australia’s most iconic coastal drives. It covers around 240 kilometres between Torquay in the east and the outskirts of Warrnambool in the west. The journey along the Great Ocean Road passes through several coastal holiday towns and showcases the natural beauty of this part of Victoria including rugged coastlines and rock formations, the famous 12 Apostles, beautiful beaches, lush rainforests, mountain scenery and native flora and fauna. If you are in Melbourne, there are several ways to reach the start of the Great Ocean Road at Torquay. Torquay, which marks the official start of the Great Ocean Road, is around 100 kilometres from Melbourne by road. Head west along the West Gate Freeway (M1), across the West Gate Bridge, and then this road becomes the Princes Freeway (M1) as it skirts around Werribee and the large city of Geelong. Take the Anglesea Road (C134) exit off the freeway and follow this road for around 14 kilometres until you reach the Great Ocean Road (B100). Turn left if you want to head into Torquay (5 kilometres away) or turn right to skip Torquay and head along the rest of the Great Ocean Road towards Anglesea. Driving a vehicle is one of the best ways to see the Great Ocean Road. You can stop at various towns you pass through, view the many lookouts on the side of the road, and take a few popular detours along the way, such as the Cape Otway Lighthouse, the Otway Fly tree top walk and a number of waterfalls. 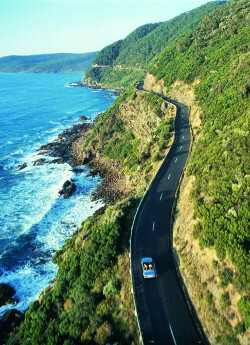 It is quite common to break the journey along the Great Ocean Road into several days, so as to get the most out of this scenic driving adventure. You can stay overnight at popular locations including Lorne, Apollo Bay and Port Campbell. If you don’t have your own car, consider hiring a vehicle to get the most out of your Great Ocean Road visit. Getting to the Great Ocean Road by public transport involves a train journey followed by a bus trip. Catch a V/Line train from Southern Cross Station in Melbourne to Geelong. This journey will take approximately one hour. See the train timetable to Geelong. From Geelong Station, there are a number of bus services you can catch, depending on exactly where on the Great Ocean Road you want to travel to. From Geelong to Torquay, it will take approximately 40 minutes. V/Line Warrnambool bus – Geelong to Torquay, Anglesea, Aireys Inlet, Lorne, Wye River, Apollo Bay, Lavers Hill, Port Campbell and Warrnambool. A number of guided tours of the Great Ocean Road depart from Melbourne. Sit back and relax and you are driven to the start of the Great Ocean Road and then along this scenic iconic route, stopping off at a number of popular attractions along the way. The entire trip from Melbourne and back, usually going as far as the 12 Apostles, Loch Ard Gorge or Port Campbell, can be covered over one long day. As well as day tours to the Great Ocean Road, a number of organised activities are available, including surf lessons, sky diving, kayaking, snorkelling and scenic helicopter flights. If you are coming to Melbourne by air, see our guide to transport between Melbourne Airport and the city centre. Once in Melbourne’s city centre, choose from the above options to get to the Great Ocean Road. The Grampians is one of Victoria’s most popular natural attractions. Located north-west of Melbourne, it encompasses a huge national park which surrounds a series of mountain ranges. Visitors can explore many walking tracks including the Grampians Peak Trail, enjoy panoramic views from lookouts, and visit several lakes and waterfalls. It is a great place to encounter Australian wildlife, native wildflowers and discover historic Aboriginal sites. At the heart of The Grampians is the tourist village of Halls Gap. Visitors will find shopping facilities, restaurants and a large concentration of accommodation options including caravan parks, holiday units, cottages and motels. The distance, in a direct straight line, from Melbourne to Halls Gap is about 230 kilometres. There are a number of ways to get to The Grampians from Melbourne. The journey from Melbourne’s CBD to Halls Gap is just over 250 kilometres. Head west along the West Gate Freeway (M1), across the West Gate Bridge, and take the Western Ring Road (M80) exit which is about 6 kilometres after the bridge. After travelling on the Western Ring Road for 4 kilometres, take the Western Freeway (M8) exit. Keep following this freeway which will skirt around Bacchus Marsh and the city of Ballarat. The Western Freeway will become the Western Highway (A8), and the first town you will pass through the centre of will be Beaufort. Drive a further 44 kilometres until you reach the larger town of Ararat. Turn off the highway and onto Ararat – Halls Gap Road (C222), following this road to a T-junction just on the northern outskirts of Halls Gap. Turn left into Grampians Road (C216) and after a few short minutes, you will arrive within the centre of Halls Gap. The entire journey will usually take around 2 hours and 45 minutes if you drive continuously. However it is recommended that you do not drive for more than 2 hours straight without taking a break. Getting to Halls Gap from Melbourne using public transport requires the use of both train and bus services, however there are a couple of main options. Which one you choose may depend on how the timetables fit in with your personal travel plans. Catch a V/Line train from Melbourne’s Southern Cross Station to Ballarat Station. This will take about 90 minutes, however some peak express services will complete the journey in a quicker time. Once in Ballarat, switch to a V/Line bus which goes to Ararat and Stawell. This section of the journey will take about 90 minutes. From Stawell, catch the Halls Gap bus which will have you arrive in the Halls Gap town centre within about 35 minutes. See the V/Line timetable which covers this entire travel option. Catch a V/Line train from Melbourne’s Southern Cross Station to Ararat Station. This will take between 2 hours and 10 minutes and 2 hours and 30 minutes depending on the time of day. See the timetable for the train to Ararat. Once you arrive in Ararat, catch the Warrnambool bus and get off 50 minutes later at Halls Gap. See the timetable for the bus to Halls Gap. 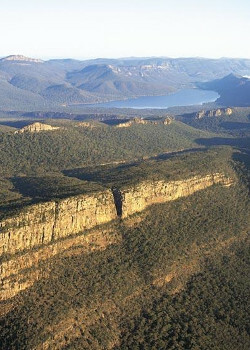 Take the easy option when heading to The Grampians and join one of the several guided day tours that depart from Melbourne. You won’t have to worry about how to get there or finding your way around when you arrive. You will also have an experienced guide that will be able to transport you directly to the many attractions of The Grampians, with some interesting stops along the way. 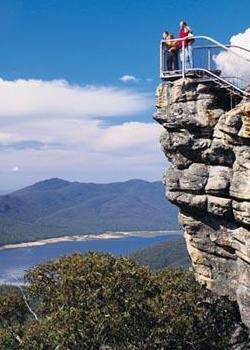 Day tours of The Grampians can include guided walks to waterfalls, lakes and scenic lookouts. Experience close encounters with native wildlife, discover a rich variety of plant life and learn about the history and Aboriginal culture of the area. If you are coming to Melbourne by air, see our guide to transport between Melbourne Airport and the city centre. Once in Melbourne’s city centre, choose from the above options to get to The Grampians.